The Lyric is proud to present our Black History Month Film Series! 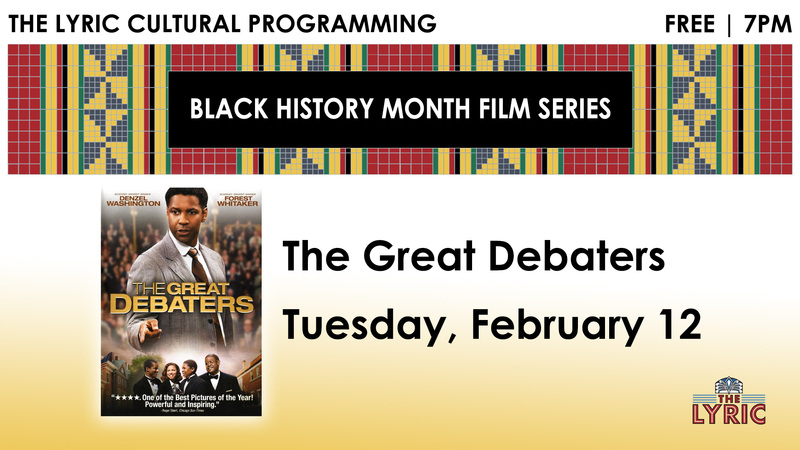 Join us on Tuesday, February 12, for a FREE showing of The Great Debaters at 7 PM. Poet and professor Melvin B. Tolson (Denzel Washington) teaches at the predominately black Wiley College in 1935 Texas. He decides to start a debate team, something nearly unheard of at a black college. While at first he butts heads with the influential father (Forest Whitaker) of one of his best debators, eventually he is able to form a team of strong-minded, intelligent young students, and they become the first black debate team to challenge Harvard's prestigious debate champions.